Add 9' crank and tilt umbrella for just $29.95 below. Rio Sun blocking beach umbrellas. Special offer: add the Sand Screw umbrella holder to this order for just $2.95 (regular price is $12.95). This offer is good only with the purchase of a beach umbrella. Please add Sand Screw one-click below. Sun blocking Beach Umbrellas with SPF 50. The Earthworm beach umbrella anchor for hard packed soils. 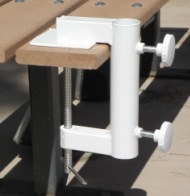 Our $49.95 9 foot umbrella can be added to your Bleacher Buddy order for just $29.95!